American Gourmet Initiated a Voluntary Recall of its Roasted and Salted Pistachios on March 24th. The announcement marks the fourth recall of pistachio products in 15 days. 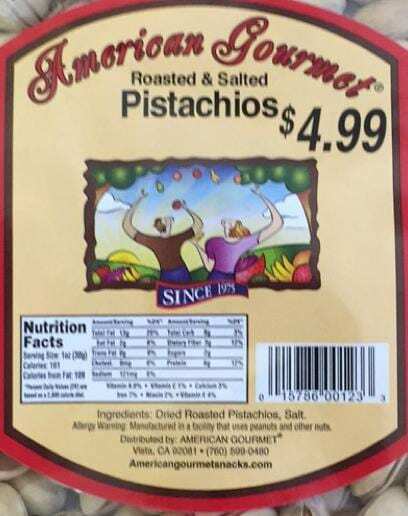 American Gourmet announced a recall of American Gourmet Roasted/Salted Pistachios due to potential Salmonella contamination. The The company’s third-party pistachio supplier instructed the company to initiate a voluntary recall. American Gourmet complied with the request, issuing a recall on March 24th. 7.5 oz. packages of Roasted and Salted Pistachios with “Best By” dates of 11.5.2016 through 1.3.2017, UPC Code 1578600123. In the past 15 days, three other companies initiated recalls of their pistachio products. The CDC announced a multistate outbreak of Salmonella Montevideo linked to products distributed by Wonderful Pistachios on the same day the company initiated the recall. The outbreak involved eleven cases, including two hospitalizations, spread across nine states. Two cases were confirmed in both Washington and Arizona, while Alabama, Connecticut, Georgia, Michigan, Minnesota, North Dakota, and Virginia each confirmed one case involving the outbreak strain. Two additional companies issued voluntary pistachio recalls one day after the announcement by California Pistachio. Texas Star Nut and Food Co. Inc. recalled “Nature’s Eat Natural Pistachio Kernels” on March 10th. A third-party lab contracted by the FDA tested and analyzed a sample of the product as part of a routine, random sampling program conducted by the FDA. The test results revealed that the product contained salmonella. The announcement indicated that the recall only affected Texas and Louisiana consumers and retail locations. The Boerne, Texas company expanded the its recall on March 14th to include nine additional products. The expanded recall involved products sold under the brand names Fresh Choice, Southern Grove, and Nature’s Eats. The company recalled only one Fresh Choice product. Two Southern Grove and six Nature’s Eats products were also added to the list. All recalled products were sold between August 13, 2105 and February 24, 2016. The recall no longer involved only two states. Retail establishments across the nation sold products appearing on the expanded recall list. Texas Star Nut and Food Co. stopped distributing all recalled products containing pistachio kernels. Kanan Enterprises Inc., a Solon, Ohio corporation, recalled “Favorites Natural Pistachios” at the request of the third-party producer that supplied the pistachios. The product was distributed to and sold by convenience stores nationwide. The third-party supplier asked the company to issue the recall because the pistachios had the “potential to be contaminated with Salmonella,” according to Kanan Enterprises’ press release. Food Poisoning News will continue to provide information about this outbreak as new information is released or obtained directly from officials by our food poisoning attorneys. If you became ill after eating pistachios or suspect that you have been a victim of food poisoning, use our online case evaluation form or call 1-888-335-4901 to get in touch with an attorney from Ron Simon & Associates today for a free case evaluation.